Put Your Brand Ahead of The Curve. Our A5 Curve notebook has function but also a lot of style. Frosted Polypro cover with a coloured Curve in a choice of colours. Stay-Closed feature to make sure your loose notes are safe. Inside are 50 sheets of quality 80gsm paper that can be printed as you want. Add lines, squares, dots to keep plain. You can also show your logo. The Curve Wiro Promotional Notebooks are truly great notebooks to promote your brand. Use for office gifts or conferences. The choice is yours. Price includes Logo Printed in One Colour to Front. Should You Care About Curve Wiro Promotional Notebooks? It’s not a life or death issue, we agree. But for promotional notebooks they are versatile. Wiro has long been the preferred choice for an office or conference. Everybody needs one. Whether this is to make notes at meetings or events. Whether to doddle or create a masterpiece. Or perhaps to lay plans for that new building or invention. You are the best person to know who will use your Curve Wiro Promotional Notebook which is why ours allow you to create your own. The Notebook Warehouse is part of Per Annum Ltd. Founded for over 25 years we provide many clients with their branding needs. Our main aim is to provide the very best in quality of goods and service. We know how important these will be to you and so we strive to achieve them daily. Curve Wiro Promotional notebooks are a small part of what we can offer. Call us, let us know all of your needs, you will be surprised at what else we can do. 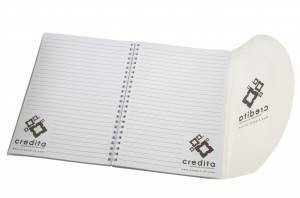 When you need Promotional Notebooks and more, we are sure you will find, we are the best choice.